Last months were very hot on the MLO beta forum. The users received the new Android version for testing and were trying hard to reveal even the tiniest bugs. Now, thanks to the great efforts of the beta testers and the MLO team, we are ready to announce a release date. Meet MyLifeOrganized for Android V2 in mid-November! We know, it’s been awhile since we have started the development of the new app for Android. And we are ready to tell, what we have been doing for so long. We would like to emphasize, that we didn’t want to create just a lightweight version of our full-featured Desktop software. 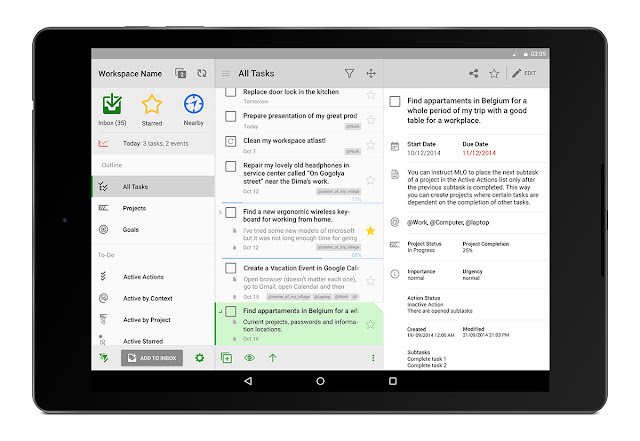 We wanted to develop a powerful, stand-alone Android app, which could become your personal task manager with just a little or no help from desktop side. To reach our goal, we had to solve the three main issues. The flexibility of MLO is ensured by a great number of settings you can use, and we wanted to transfer this feature to the new version for Android. We couldn’t shove everything into a single screen, because it would result a jumble of settings, buttons and to-dos. At the same time, users would not appreciate, if we made them to perform too much clicks between different screens of the app. It was not so easy to find a right balance between the app power and the elegance of UI, but together with beta testers we seem to have found the proper solutions. The second complexity was to implement the long-awaited request of our users to import all the custom views from the Desktop version to a mobile device and allow editing of these settings on device . There are hundreds of custom views possible in MyLifeOrganized! But we made it happen, and after several months of tests we can say that any view can be imported to your smartphone or tablet. Seriously, any view. At first, we didn’t put calendar view on the list of V2 features. But after the development of V2 for iOS it became clear that we have to include this view in our plan. The MLO users waited for it to be implemented on Android platform for so long that we just can’t deceive their expectations. Since the calendar view is a feature quite hard to implement, we are planning to add at least a simplified version of it by the release moment. And we will refine it in further free updates after the go-live. UPDATE Nov 18th : We are performing the last tests with data migration. We want to be absolutely sure that your MyLifeOrganized tasks migrated smoothly to MyLifeOrganized 2. It took a little longer than we expected. But our target is still to release in November. UPDATE Nov 26th: We started the rolling out of MyLifeOrganized 2 for Android yesterday. We are adding new devices every day to control this process. Please wait for the update notification on your device. More detailed information will be provided soon. UPDATE Dec 1st: MyLifeOrganized 2 for Android is available for all the devices starting from today! Thanks for the update on this. While I love the power of MLO and use the Windows desktop version while at work, it has been very difficult to manage my personal life in the app as I am a Mac owner, so had to manage it from my Android devices. I found it to be very difficult to use the current app successfully, but have stuck it out waiting for this new version! Looking forward to giving it a go in November. Looking good Andrey, looking really good. I can't wait for November now, Santa will be coming early. Looking forward to this, will renew my cloud subscription once released as it starts making all sense again. I can't wait. I prefer using the beta version with some flawless than just waiting the formal version. Could you please release a version in the blog sooner to people like me? Wonderful, Finally! Can't wait for November to come! This is great news and I'm really looking forward to this release. I would have to admit that I stopped using the Android version because it required to many clicks to edit a task, also changing the due date would break the reoccurring pattern. I absolutely love the desktop version & the ability to run it from a USB drive. This is by far one of my favorite app. Please do not ever stop developing this app. So excited to see the changes that you've worked hard to implement correctly. I think I speak for many users when I say we truly appreciate the commitment to a user-satisfying design improvements and that you are committed to smooth transitions, even though they can take much longer (and get a lot of user impatience)! This is one of the reasons I consider MLO to be developed with the highest level of professionalism, and why I am always 100% confident in recommending it to anyone I can think of. It can only get better. ..Looking forward to it. Eagerly waiting for the release of v2. Experienced the today view with graph in beta. Good to know that calendar view is added in the release. Thanks Audry, I can't wait ;-). I dashed to read this announcement with the hope that it was about MLO on a Mac..ah well. For what is worth, i love using MLO but of late and as a recent Mac laptop user, i'm genuinely struggling to sync between devices using Crossover (Had to pay £38 for 12 months) purely for MLO on a Mac. I genuinely wish that the Mac version was out. Has any of your beta testing included how it works on a blackberry q10/classic with its smaller square screen aND physical keyboard? Sorry, the tests involved only pure android devices. We hopefully await the November release. MLO is a powerful tool and we are anxious to see the update. Isn't it mid-November already? Can't wait! The color scheme in an app is very important to keeping me coming back and using an app every day. Will you be offering any additional color themes ( such as blues) ? Thanks. Good luck with your launch! Tic toc, tic toc . . . I'm anxiously awaiting the new release of MLO. I'm blaming myself for not applying for the Beta and being able to not only influence design features but also experience the new features sooner. Any updates? or the release is postponed again? Hello everyone! We are making our last preparations before the go-live. The app will be released in November in the nearest time, and we are also very intrested in doing this asap. Thaks for your patience! Are we still looking at a November release? That's what the update seems to indicate. I was getting excited for the updates... anticipating for the v2 rolling out. But then, it is delayed. Please don't let our hopes high only to let us down. If you said it will be at the end of November, I'll be gladly wait. But now, I'm not that excited anymore. Please do your best for getting the preparation right before the go-live. And thank you for the updates. I totally agree with you Freddy. This is pretty funny. MLO organization in not organized enough to release product within the promised time frame. Sorry, had to say it. I hope the real deal is the real deal. Have ben waiting long time for V2. I've just recently come across mlo and love it. I used a task management app on blackberry years ago and have not been able to find anything that was as good as that application until I came across mlo. I have been waiting on v2 for the custom views to see how well that works before I actually purchase so I hope it comes out soon before my trial runs out. Does anybody know if I purchase now will I get a free upgrade to v2? Today is 22nd November 15. When is mid - November? Update: We are performing the last tests with data migration. We want to be absolutely sure that your MyLifeOrganized tasks migrated smoothly to MyLifeOrganized 2. It took a little longer than we expected. But our target is still to release in November. Clearly MLO is the killer app for people who refuse to yield to life's uncertainties...including myself. HELP! It feels like I'm floating in outer space without a packed lunch!! We have started the rolling out of MyLifeOrganized 2 yesterday adding more devices every day. Please wait for the update notification on your device. I'm not in software development, but since I like following development of apps, I can relate to your problem and know your hardship in developing product. And you're doing a great job in developing MLO! Yaay! I can hardly wait for my notification! What is the install base ((all platforms) number (approximate) for MLO ?. Is it pretty decent?. Just wondering if MLO is going to be around for the foreseeable future. This is such a great product but don't think many folks know about it compared to Todoist or Wunderlist or AnyDo. MLO, Can we please have a current update on what is happening ? If its still in the oven, please just let us know so we can keep waiting. Ix it not going to be available on the Google Play Store? I have the trial version installed now, but I was waiting for V2 to roll out so that I could purchase it on the Play Store. Yes it will be availalbe on Google Play. It is actually already available for some devices. The rest will be added soon for the update. Reading on so many positive reviews from those who have already received the update, i can't wait for the rollout on my HTC One M7! :-) i'm overly excited !! You can download the application V2 also from the MLO website and install it on your mobile phone. Search the link "Download" on the lower side of the MLO ANDROID Web page. You should get a MLOAndroid.apk file. The click on the file (search it by a file browser, usually on the folder "Download". Usually Android refuses to install .apk files for safety reasons. To let Android install such apps you have to go to Android Settings and set "let Android install from unknown sources" or similar words (sorry I am Italian and my mobile has Italian language). I already have version 1 on my Android, should i uninstall it first please? Also, please forgive me for sounding daft but, i received a code to upgrade my v1 to v2 and its asking me to pay £13.08, are we being charged for an upgrade? I do not know if needed to remove first V by I do not think necessary. I expected a fee to pay, but it seems a high price for an Android app. Expecially for the people that already buy ed the V1. Sigh... no device notification for me yet .. and I have a Galaxy S4 and a Note 10.1 - 2 popular devices... I wonder which devices are updating? I have just downloaded v2 onto my tablet. Stupidly I thought there was going to be a notification. After seeing LaGoccia comments I went ahead and downloaded but had to pay full price... Something was awry there so I'll try and sort a refund. It would be nice that someone of the MLO team gives us some info about it. Thank you. Hi MLO support, help please, i have tried to upgrade it but the conversion price is wrong.$14.95 into £'s is roughly about £9.93 and not £13.08. Am i missing something here please? I have now the new MLO2 on my phone and tablet. I like it. Nice job. Thank you. Only little thing I would like is clout for the folders. I find the grey a bit sober. But this app is great!!! Color for the folders I mean, sorry all. I downloaded the MLO V2 today and just found some bugs. Can I post them here? When using a Bluetooth Keyboard, "Backspace" deletes two letters, instead of one. Also with the Bluetooth Keyboard, English is the only language I am allowed to type in. Though the TaskBar on top of the screen (Android Device) shows the input language was toggled to other language (Korean - my language), the letters MLO displays are only English. I have tested these symptoms with two different Bluetooth Keyboard which did not have a problem with the prior version or other applications. The problem appears only with Bluetooth Keyboard, the Smartphone's Touch Screen Keyboard does not cause this issue. But thank you for your efforts on developing and enhancing this application. MLO is one of the most frequently used apps in my phone!